NETWORK UPDATE: SHARK TANK and HAWAII 5-0 each gained 0.1 in final numbers. CABLE HIGHLIGHTS: Discovery had 2 of the night’s Top 3 cable shows with the returns of GOLD RUSH (1.21) and lead-in GOLD RUSH: THE DIRT (0.51). Disney Channel had 3 in the Top 10: GIRL MEETS WORLD, which without last week’s INVISIBLE SISTER lead-in dropped two-tenths to 0.57, SOFIA THE FIRST (at 9AM) at 0.40, and JESSIE at 0.37, with I DIDN’T DO IT #11 at 0.33. Adult Swim’s BLACK JESUS ticked down to 0.47. Nickelodeon’s PAW PATROL was at 0.43. 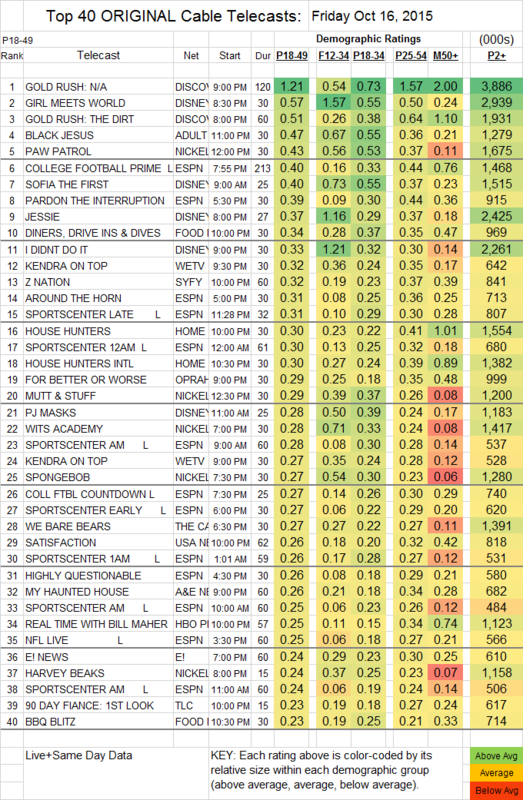 On Food Network, DINERS, DRIVE-INS & DIVES was at 0.34. We’s KENDRA ON TOP was at 0.32/0.27 after last week’s 0.25/0.24. On Syfy, Z NATION fell 0.08 to 0.32, and the series finale of CONTINUUM didn’t end its run on a high, dropping 0.04 to 0.10. OWN’s FOR BETTER OR WORSE slipped 0.04 to 0.29. USA didn’t seem to do much to promote the return of SATISFACTION, and it showed with a 0.26. REAL TIME WITH BILL MAHER (HBO) gained 0.04 to 0.25. 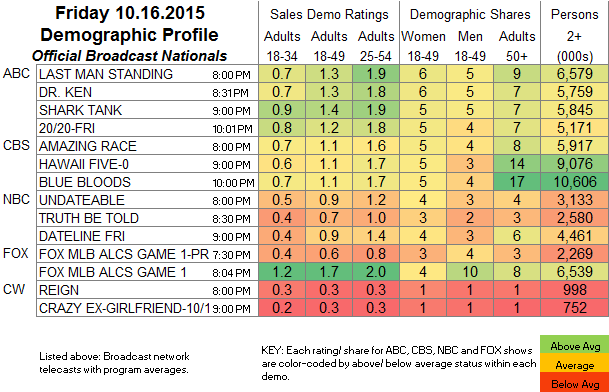 On Lifetime, STEP IT UP lost a hundredth to 0.18, and JACKSONS: THE NEXT GENERATION dropped 0.06 to 0.12. A&E’s THE ENFIELD HAUNTING fell 0.12 to 0.14. Cinemax’s superb THE KNICK didn’t gain any ratings momentum in the off-season, returning at 0.07/269K.